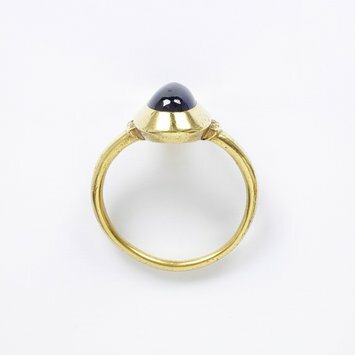 The large, polished but not faceted, sapphire set in this gold ring marks it as a jewel belonging to a person of some wealth and social standing. Gemstones were highly valued in the medieval world, sapphires, rubies, garnets, amethysts and rock crystal being the most commonly used. Diamonds were highly valued but much less common. Gemstones were valued, as now, for their colour and lustre but medieval wearers also believed they held amuletic or talismanic powers. Sapphires were particularly valued as their blue colour was a reminder of the sky and hence heaven. For this reason, they were often set in a bishop's ring. Books known as 'lapidaries' listed the powers attributed to each stone. The Liber Lapidum of Marbodus of Rennes (1067-81) was one of the most widely read and claimed that sapphires could protect the body, cool fevers and headaches, calm the eyes and cure stammers. This ring forms part of a collection of over 600 rings and engraved gems from the collection of Edmund Waterton (1830-81). Waterton was one of the foremost ring collectors of the nineteenth century and was the author of several articles on rings, a book on English devotion to the Virgin Mary and an unfinished catalogue of his collection (the manuscript is now the National Art Library). Waterton was noted for his extravagance and financial troubles caused him to place his collection in pawn with the London jeweller Robert Phillips. When he was unable to repay the loan, Phillips offered to sell the collection to the Museum and it was acquired in 1871. A small group of rings which Waterton had held back were acquired in 1899. Gold ring, the oval bezel set with a cabochon sapphire, with a leaf pattern chased on the shoulders.